“EUR/USD last week charted a tight sideways range to leave our outlook unchanged – we remain biased towards failure at 1.3245/50, the 38.2% retracement of the move down from November. However the erosion of the near term uptrend last week provoked NO follow through and we could even argue that there is a potential ‘bull flag’ developing (not our favoured view- but one we cannot yet dismiss). A relatively quiet Asian session as most ‘risk’ trades/crosses remain firmly in favour awaiting the much touted abortion of a Greek PSI deal and more importantly Services ISM and tomorrow’s NFP print. Equities providing the lead in most of these instances, while elsewhere its simple carry trade dynamics as interest rate differentials start playing a more than significant part in the daily to and fro. On the day we have French and Spanish auctions at 9.30 and 10.00 GMT respectively and with yields coming in significantly in the last 24hrs on the periphery, we can safely assume that the ECB will have their buying boots on once again his morning giving the EURUSD and artificial lift. Otherwise we also have the UK Construction PMI and US weekly claims (little significance here as tomorrow is the real day of reckoning). With regard the crosses, the main pairs, USD based are all in consolidation mode sitting firmly on the precipice of either outright success or disastrous failure. With everything in heavily overbought territory we are either due one almighty correction or sitting on what is clearly an unsustainable up trend, only time will tell. Either way, here’s how your scribe sees them today. 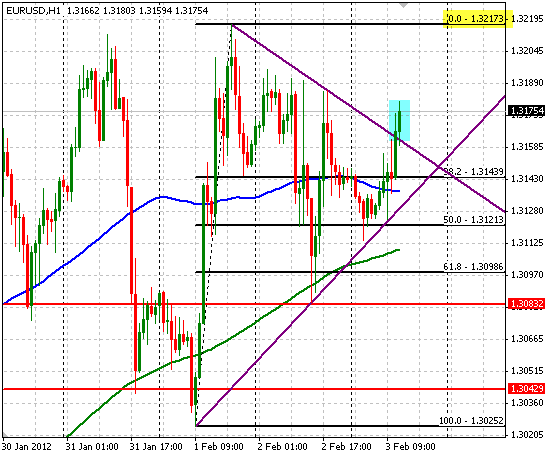 EURUSD: Support and bids come in initially at 1.3130 and then 1.3080 with stop orders layered somewhere in between. Offers won’t arrive on the scene until 1.3230 as profit takers and stop orders just above that level sit and await another dirty auction result. GBPUSD: On steroids, but perhaps fairly so in light of what else is going in the area. Having broken recent highs and resistance levels, the pair is due a mild correction/retracement, but should be more shallow than most expect. A break and close above the 1.5900 handle would see a short squeeze, while below 1.5750 we can see mild confirmation of the retracement. XAUUSD: I’m starting to take a closer at the cross as I fear also another correction is on the cards… I will keep you posted. The EUR/USD upside during the European session got capped at 1.3152 and a retracement to the 100-hour MA, at 1.3130, followed. The Portuguese bond auction sold its targeted 1.5 billion euro at lower yields than previous auction: 4.068% vs 4.346% for the 3-month paper and 4.463% vs 4.74% for the 6-month bills. The market might ease pressure on Portugal debt for some time after this and the EUR/USD could extend its upside, because the German bond auction also went well, lowering its yield (1.82% vs 1.93%) of 2-year bunds.